A rich chamber tomb (1500–1400 B.C. 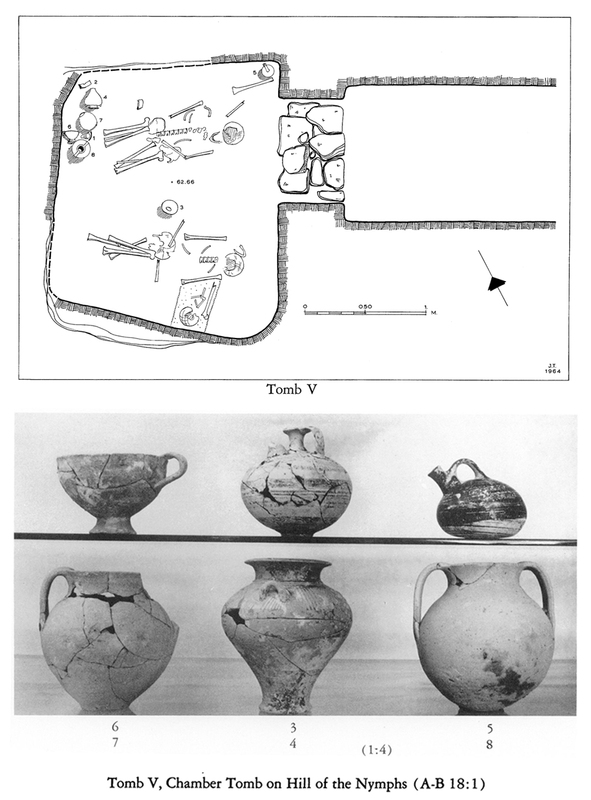 ), unfortunately looted, was probably part of a cemetery to the east of the Hill of the Muses (Philopappos); it contained golden ornaments and a piece of jewellery. The old locations continue to be inhabited in subsequent years (1400–1100 B.C. ), until a new cemetery is being formed to the west of the Acropolis, on the foot of the Hill of the Nymphs, and another one to the south on the Hill of the Muses (Philopappos), next to a curve of Ilissos river, where Dimitrakopoulou street ends today. Immerwahr 1971, 98, 178–181; Pantelidou 1975, 45–141; Mountjoy 1995, 14–15, 17, 32–36, 46, 61; Pantelidou-Gofa 1996. Plan of a Mycenaean chamber tomb and finds of the Mycenaean cemetery at the slope to the northeast of the Hill of the Nymphs.